In my search for a perfect Thai island, or, at least, the less over-run and developed place in this mecca of international tourism I came across the sleepy island of Koh Yao Noi (Small Long Island) in Phang Nga Bay. There are no industries, structures or resorts on the island. Population's main occupation is fishing with limited farming of rice and coconut. The route to Koh Yao was pretty enjoyable–short flight from Singapore to Phuket, a fun taxi ride to the Phuket boat pier with the gentle Ninie (see below), a scenic crossing of the bay in a motor boat from Phuket to Koh Yao pier. 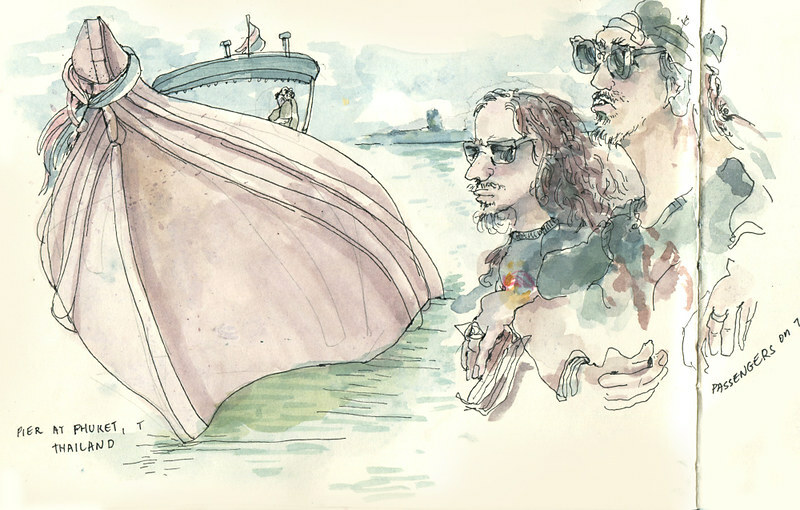 I sketched these two Thai men next to me on the boat. They seemed to enjoy being drawn. 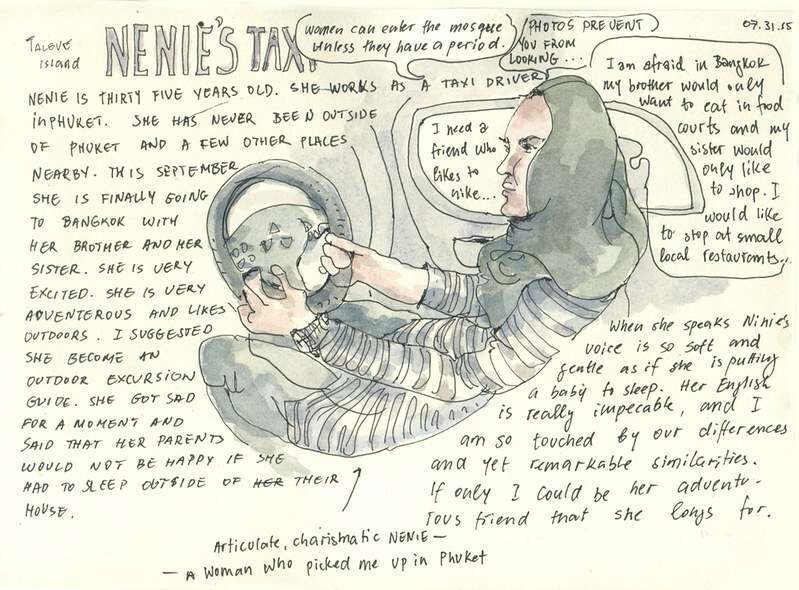 Ninie is a sweet muslim woman who picked me up in Phuket's airport and brought me to the pier. Her voice is so gentle–when she talked I felt she was singing a baby to sleep. She told me about her dream–to go to Bangkok with her brother and sister. She is afraid her brother would just want to eat in food courts and her sister would only want to go shopping. Ninie wants to have adventurous friends who would go hiking with her. The villagers of the island are very warm and hospitable. As I was making my first attempts to explore the island by bike I would inevitably turn and try to ride on the wrong (right) side of the street. They would just give me the warmest smile and wave every time they saw me. You can circle around the island in about 3-4 hours on a bicycle. The scenery is mostly lush tropical forest, small houses, and cement piers going far into the sea–the tides are pretty fierce here. As far as wild life, the island is home to many water buffalos, peacefully grazing on its lush pastures. The most exotic creature I saw was the motor lizard, a large black prehistoric looking creature. At low tide the beach is alive with millions of creatures–crabs, birds, and insects. From the first day I became addicted to getting up with the first rays of light, running to the beach to greet the sunset. Sweet lapping of warm water, bright orange sand, and the gentle blue contours of the little islands in various whimsical shapes rising above the calm mirror of the water on the horizon were all worth a few hours of lost sleep. This place was pure magic. Exposed to a large variety of Thai restaurants in Portland I was very anxious to try some authentic Thai food. 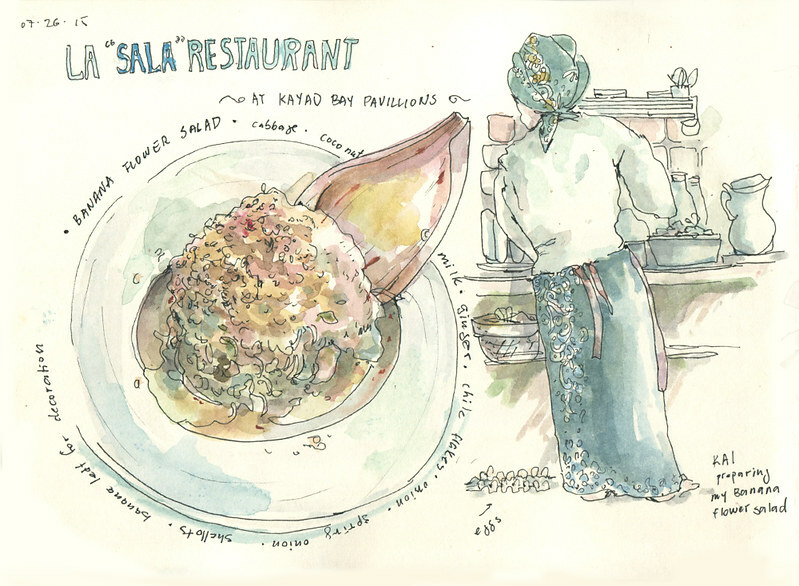 My first Thai meal was immediately my favorite–banana flower salad–the perfection of flavor and presentation lovingly prepared by a Thai woman named Kai. As I was enjoying my newly discovered paradise my only worry was that I was in this magical place all by myself–no company for sketching or swimming or sharing a meal. To my huge surprise the owner of the place where I was staying introduced me to another sketcher, a french woman named Delphine who, like me, was enjoying some quiet after the Symposium in Singapore. We discovered a lot of things we shares besides both ending up in this remote paradise–sketching, playing piano, love of snorkeling and the ocean. 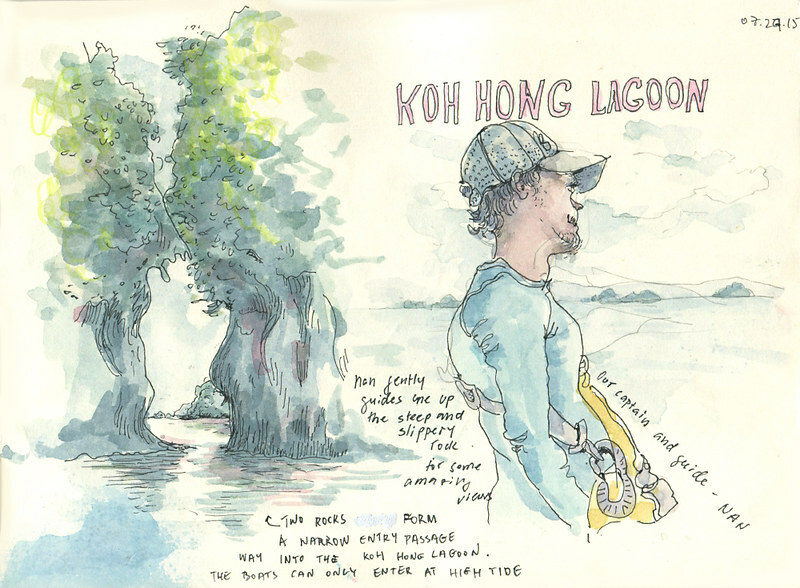 Next day we headed out to a snorkeling and sketching excursion into the gorgeous conglomeration of islands called Pa Koh Archipelago. 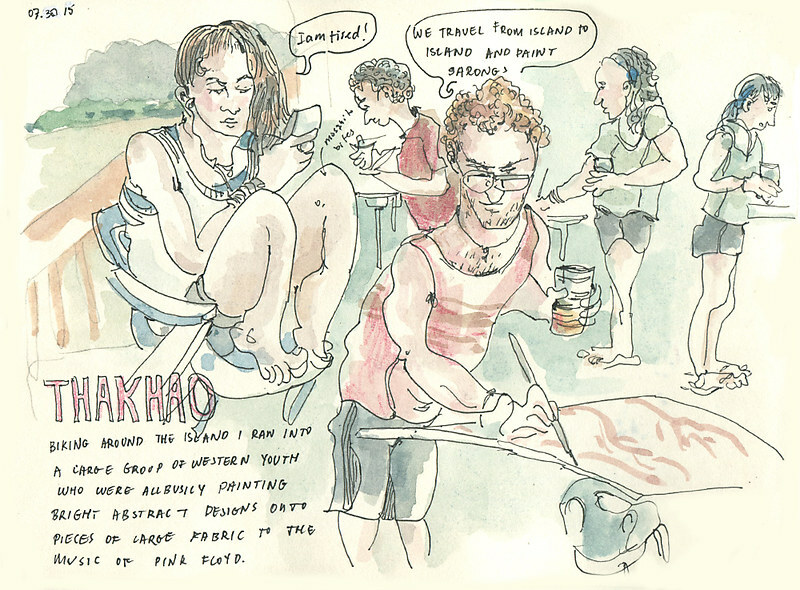 We would take turns snorkeling and sketching all day. 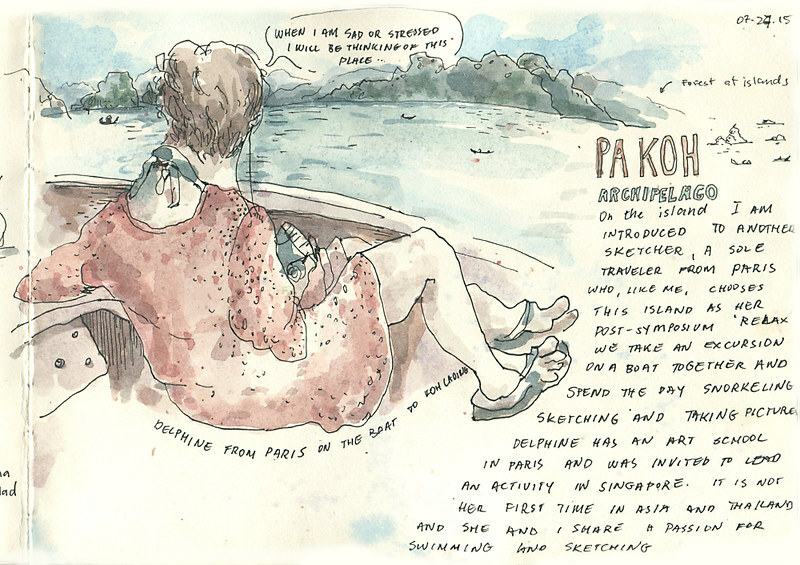 Snorkeling and sketching–I am in heaven! 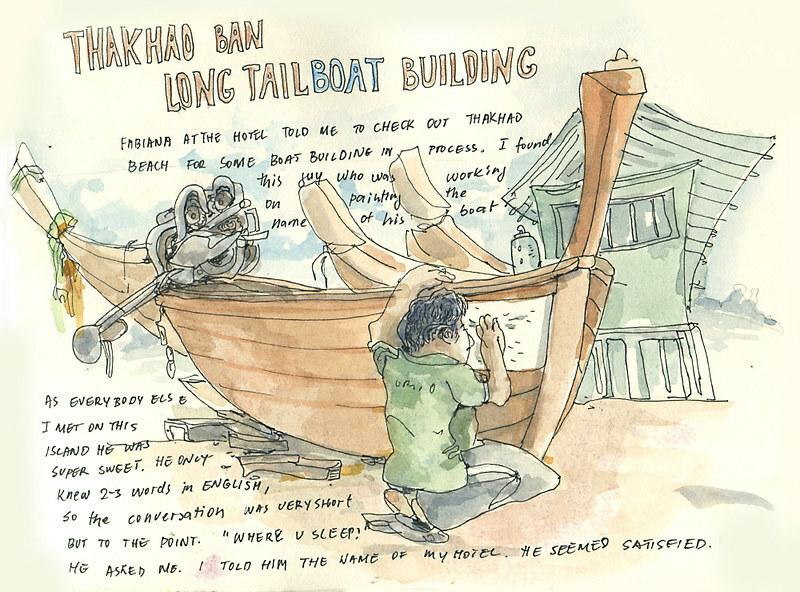 Out sweet and shy guide Nan would guide his longtail boat to the most scenic reefs. He would kill the motor and hang a little metal ladder over the side of the boat–our sign for getting our snorkels on and jumping in the water. Nan invited me to climb the steep and slippery cliff that required a lot of pulling one's weight by hanging onto ropes and trees. The view from the top was well worth the risk. Delphine stayed on the beach to sketch the boats. You can see her as the red dot on the sand below. 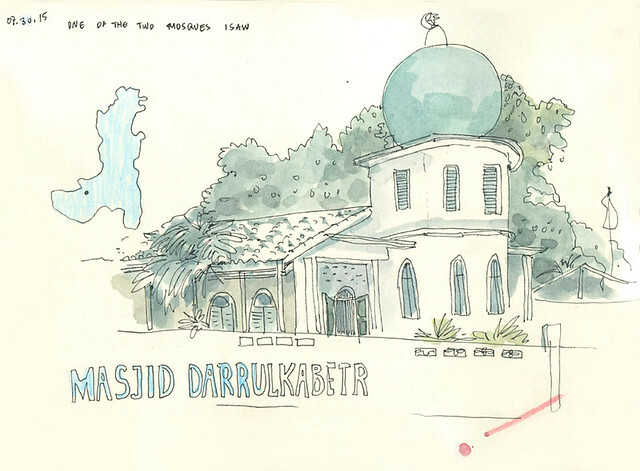 There are two mosques on the island–the majority of population is Muslim in this part of Thailand. A call to prayer could be heard very distinctly, as the island is pretty quiet, and the most sounds you hear are birds and insects. This is the smaller of the two island's mosques on the island. As I was making this quick sketch two little boys came up to me. One became quite insistent asking for something specific in Thai. At first I thought he wanted to see my drawing or my sketching supplies but he kept saying a word that sounded like "money" again and again, soon trying to reach and search inside of my backpack. Women in head scarfs zip about their business on motor bikes, often carrying their kids in front and in the back. Motor bikes are the main mode of transportation, as most places are reached by dirt roads. There is a village market that mostly consists of a few fruit and clothing stalls.I picked up some exotic fruit at the village market. 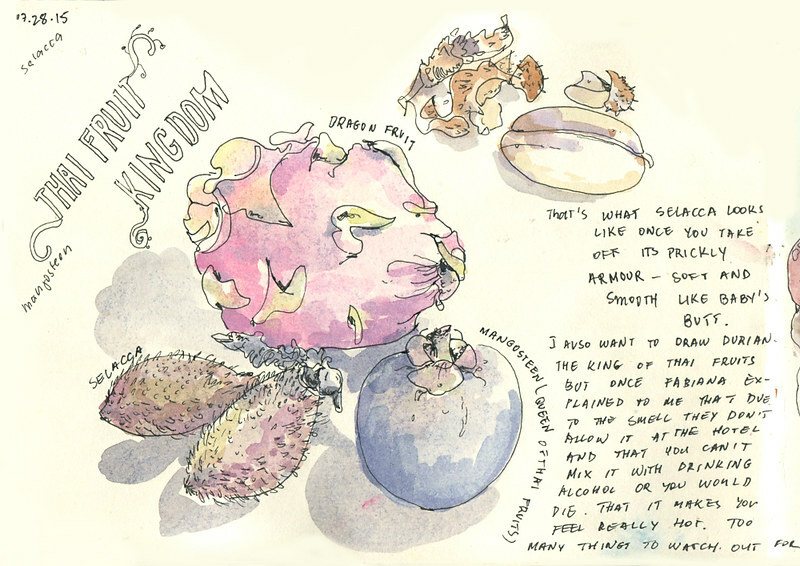 I brought some samples to my room to sketch and taste–prickly salacca, subdued mangosteen, the splendid dragon fruit. At first I thought I was looking at canisters of bright juice being frequently sold along the busier roads. Then I realized that those were village gas stations selling benzine. Fuel would typically sit in metal barrels, then hand cranked to the top transparent container with liter marks, from which customers would be able to flow it into their motor bikes and canisters. Fortunately, I didn't need any benzine juice as I was getting around on a clunky loaner mountain bike from my hotel. Biking around the island I came across a place where a bunch of American youth were painting sarongs while listening to Western rock hits. 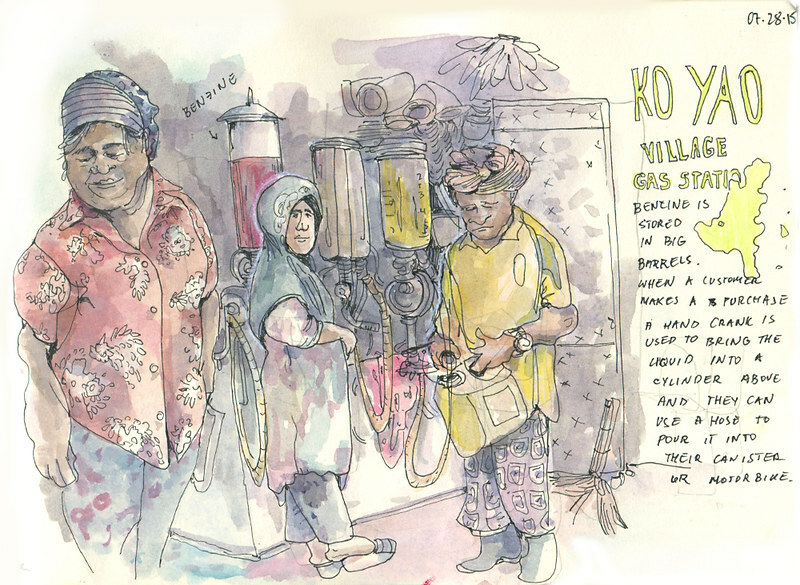 They told me that they were traveling the Thai islands and painting sarongs for charity. Fabiana, the beautiful Thai woman from my hotel recommended that I stop by this place on the beach where they build traditional longtail boats. These boats are quite beautiful–smooth dark wood and bright scarfs tied to the bow for good luck. I did in fact find one man who was busy spray painting the name of his boat. We chatted as much as his three words of English and my 0 words of Thai allowed us to do. 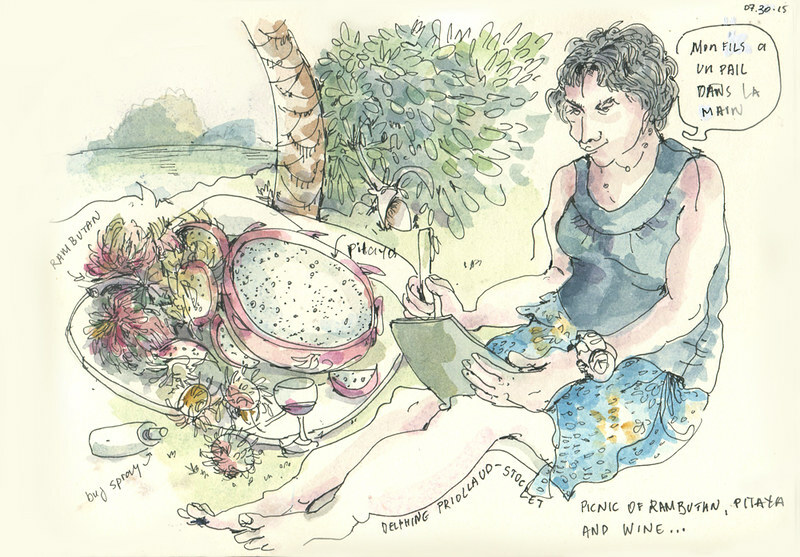 For our last evening on the island Delphine and I decided to have an impromptu picnic consisting of red wine, rambutan and dragon fruit. We stayed chatting in English and French and sketching each other defending ourselves form mosquitos and other bugs well into the sunset. 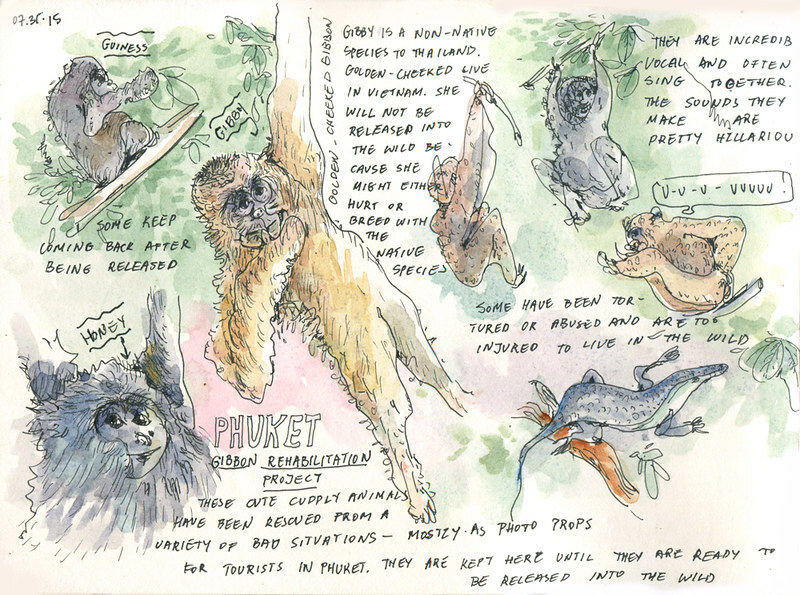 It was time to say good-bye to the island and fly off to Bangkok but I asked Ninie to make one last stop at the Gibbon Rehabilitation project on the way to the airport. Hearing their songs and watching the acrobatics of these agile primates was amazing. Each one comes here with a tragic story of past abuse, but under the care of the staff at the center most of them would make it back into the wild as soon as they are ready to fend for themselves.